Once in a year, my family will eat vegetarian food for 10 days, (Not a vegan but almost a like, it’s a Chinese vegetarian that base on the Buddhist believe. We won’t eat animal product (include dairy products) plus some of the vegetable (onion, garlic, and etc.). So, I have to find some bake goods, which don’t use egg or butter (actually, my family don’t strict to the rule and the dairy products are welcome, ^ ^. But some of my friends are very strict). 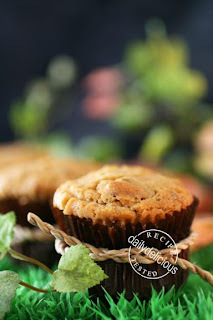 I got the idea of this cup cake from my friend (Koy), who told me about the banana cake that she made by using coconut milk. I never making this kind of cake before, I always use the recipe from the macrobiotic cookbook, which don’t use the dairy product and egg too. But the recipe from macrobiotic cookbook is not challenging me any more, and I want the new recipe that makes a moist and soft cake. 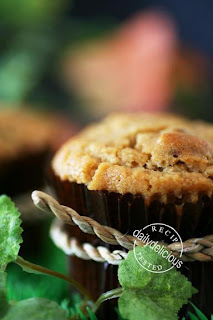 I use honey and soft brown sugar (with can’t be use in macrobiotic recipe), which I think they will make the texture of the cake moist and soft. But the first trial was a not good enough, the cake flour made the cake too soft and too moist. So the second time, I changed the cake flour into all purpose flour. The all purpose flour give the cake more structure, and I’m happy with the result now. 1. Preheat the oven to 180°C. Prepare the paper cups. Sift the measured flour, baking powder and salt together into a bowl and set aside. 2 Beat the honey and brown sugar together until combine. 3 Pour the coconut milk into the sugar mixture and beat to combine. 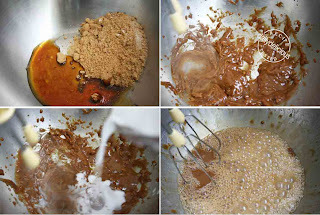 4 Pour the vegetable oil into the sugar mixture (slowly) and beat to combine. 5 Add half of the dry ingredients and beat for 2 minutes until the mixture is thickened. 6 Add the last of the dry ingredients and nut, and mix well. Spoon batters into paper cup, bake for 25-30 minutes, or until the toothpick insert in the center comes out clean. On a break and waiting to get home to try this pretty cupcake! Aha, now I know why my eggless cake is too soft and crumbly! I always thought it was due to the lack of egg white to provide strength... I will try to use the AP flour in future. I hope you have more vegetarian cake recipe to share. 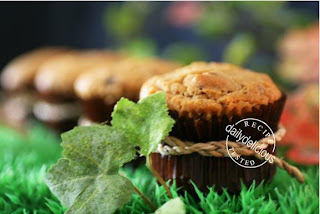 I love eggless recipe but it is sooo difficult to come by! 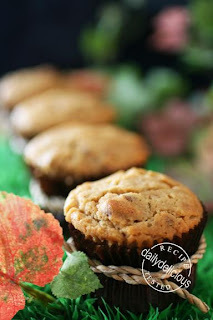 Caramel Nut Muffin: Great pairing every time!